Greenmount Veterinary Nursing Cup Winners: Catherine Davey (Belfast), Karen Horner (Belfast) and Emma Clarke (Hillsborough) showing off their cups at a recent Awards Ceremony at Greenmount. Also included are Dr Sam Kennedy Head of Education Service and Dr Michael Mullan Head of Agriculture Education Branch at CAFRE. In the fourth ceremony of its type, more than 30 students received various awards in Animal Nursing and Veterinary Nursing at the College of Agriculture, Food and Rural Enterprise’s (CAFRE) Greenmount Campus recently. The college is the only centre in Northern Ireland to offer the veterinary nursing course approved by the Royal College of Veterinary Surgeons and competition for places is high. Dr Sam Kennedy, head of education service, paid tribute to the dedication shown by the students on these programmes saying that he had seldom come across more committed students. Many students travel considerable distances to attend their classes and their attendance records are exemplary. Several among them have to balance substantial family commitments or had even given up professional careers to retrain as veterinary nurses. Karen Horner from Belfast was first overall on the animal nursing assistant programme and received the veterinary surgeon’s supply company cup. Catherine Davey also from Belfast was first overall on the Level 2 programme and received the Merial Cup. Emma Clarke from Hillsborough was first overall on the Level 3 programme and received the Norbrook Cup. 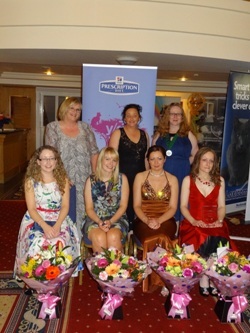 The winners of the BVNA Northern Ireland Vet Nurse of the Year award have now been announced. This year, some great nominations have resulted in a tough task for judges deciding on the winners in each of the four categories. The event, supported by Hill's Pet Nutrition is now in its fifth year and was initiated to help veterinary nurses receive wider recognition of their work. The quality of the nominations reflects growing appreciation of the tremendous efforts nurses put into caring for their patients and animals in the wider community.